Ciaran O'Connor is looking forward to getting the chance to impress the Brandywell support on his home debut tomorrow night. DERRY CITY striker, Ciaran O’Connor is hoping to introduce himself to the ‘Brandywell Faithful’ with a goal tomorrow night on his home debut against Drogheda United and shoot the ‘Candy Stripes’ towards Premier Division safety. On loan from Dundalk until the end of the season, the talented 19 year-old has experienced a stuttering start to his Derry City career since his signing last month. The ex-Ballinamallard hitman made his debut against Galway on August 7th and turned the game on its head when replacing Patrick McEleney in the first half, netting the opening goal and setting up Mark Timlin for his second in the 0-4 romp. His impressive start in a City shirt was then curtailed due to Dundalk’s insistence the striker couldn’t play against his parent club the following week at Brandywell. His next outing was in the disappointing 1-0 loss to Sligo Rovers but once again he had to sit out the following game against Drogheda in the FAI Cup as he was cup tied. O’Connor netted the winning goal against St Pat’s last Friday night and he’s delighted to get the chance to play consecutive games for the ‘Candy Stripes’ for the first time when he lines out against Drogheda tomorrow night. (Kick-off 5 p.m.) It’s his first chance to play in front of the home support and he’s eager to impress. “It’s my first home game and first time I get to wear the Candy Striped jersey as well,” he enthused. “So it’s something to look forward to. “It has been stop-start for me with missing the FAI Cup match and Dundalk game,” he admitted. “I have only played three games and we play Cork in the cup next week and I’ll have to sit out that one as well. 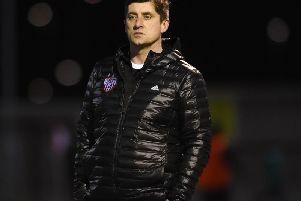 The last time he played at Brandywell resulted in a home defeat for City when lining out for Dundalk but he’s confident Peter Hutton’s men can get a crucial victory against Drogheda. “I played at Brandywell a couple of times with Dundalk and we won up here. But the less said about that the better,” he laughed. Derry boss, Peter Hutton believes O’Connor has been a terrific signing for his squad and he feels he has plenty more to offer from now until the end of the season. “He’s fitted in really well with the group,” said Hutton. “He’s a great character. He loves his football and is really enjoying it because he’s playing and scoring.